When I pick up a new cookbook, I usually find only a handful of recipes I am interested in... But I have to say I am very excited about this collection! I just want to cook everything in it. 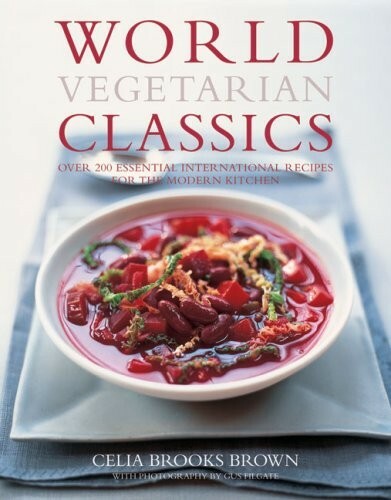 Organized geographically with every continent represented, this is the definitive collection of vegetarian recipes from around the globe. Dishes presented range from such standards as Boston Baked Beans and Moroccan Mixed Vegetable Couscous to more exotic fare, including Coriander Pea Cakes in Coconut Curry from Mauritius, Son-in-Law Eggs from Thailand, and Ukrainian Borsht. Features include highlights on key foods designed to demystify exotic ingredients and interviews with international experts and chefs. Extensively researched and filled with appetizing illustrations, this sumptuous recipe collection will be an unending source of inspiration for the discerning cook. Celia Brooks Brown runs a successful vegetarian catering company is the author of Entertaining Vegetarians, Low-Carb Vegetarian, New Vegetarian, and Party Food for Vegetarians.